Situated on the sandy western shores of West Lake Okoboji in northwest Iowa, Crescent Beach Resort has provided family vacations and group outings with lakefront view and access to generations of satisfied guests. 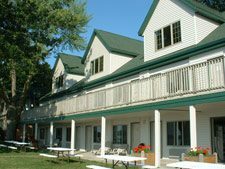 Whether you are planning a week long vacation, a long weekend get-a-way or a business retreat, Crescent Beach Resort offers something for everyone. 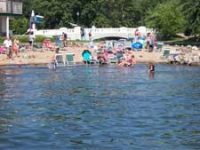 Relax in your remodeled lakefront accommodations while the children play on the sandy beach, rocket down the rocket slide or play a round of mini-golf on our island playground. Our location is convenient to all area attractions, shopping, golf, amusement parks, trails, and more. After a fun filled day at the resort or out and about, many parents tell us relaxing along the lakeshore or around the bonfire with the kids is the perfect ending. If you plan to bring your own boat, pontoon, or personal watercraft we have hoists available for rent. Please inquire when making your reservation. 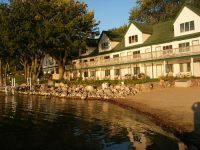 On behalf of the new owners, the management team and our entire staff, we look forward to having you as our guest and making Crescent Beach Resort, your place on Okoboji!